This report seeks to explore options around integrating transition risk into mainstream stress-test scenarios used by financial supervisory authorities. It analyses options for integration into macroeconomic, asset-class and sector risk factors. It focuses in particular around the implications of considering the shock described in the ‘too late, too sudden’ paper of the ESRB advisory scientific board (2016). The paper concludes that at macro level, transition risks are not material enough in the short-term to impact the existing macroeconomic parameters nor the existing asset class assumptions. Secondly at sectoral level in turn, transition risk scenarios become relevant, but the sectoral detail of these scenarios is too granular and expansive for the existing stress-testing framework. Finally, it shows that in order to integrate climate factors into stress testing, supervisors face a number of obstacles notably the mismatch of the time horizon of risk models (3 years) on the one hand, and the speed and time frame of climate risks materialization, on the other hand. 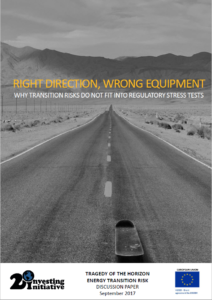 For supervisory authorities, assessing energy transition risks is therefore ‘the right direction’ to follow, but stress tests are likely to be ‘the wrong equipment’. The paper concludes by recommending the development of a specific monitoring process and infrastructure for assessing the potential systematic mispricing of long-term, non-cyclical, non linear risks (e.g. disruption related to the energy transition, to automation, etc.) by financial markets.